This is a nice size chiminea for a smaller patio. Tonala Outdoor Fireplace for burning wood, charcoal, and artificial logs. 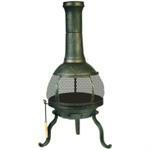 This small patio chiminea provides a full 360-degree view of your fire. Designer embossed cast iron construction with high-temperature paint finish. Fine wire mesh spark screen. Large sliding door. Chimney with rain cap. Log grate and fire tool included. Dimensions: 15" diameter x 35" high; weighs 33 pounds.